The B-side of Saundra Mallett’s one and only single with the Vandellas is a bit of a strange case. Whilst the A-side, the slightly lumpen dancer Camel Walk, sounded more like a Vandellas record which happened to have Saundra (later of the Elgins) singing lead on it, this B-side is more like an Elgins record which happens to have the Vandellas singing backup. Indeed, four years later, Motown would include this recording on the Elgins’ début LP Darling Baby in 1966, listed as an Elgins track, with no mention of the Vandellas at all. I have to say, this one is definitely the stronger song of the two sides, a restrained, downtempo jazz-tinged bluesy number with a pretty tune. Not a single, and hardly a classic, it’s still a nice song. It’s also a better recording than the A-side; the band sound good, with warm guitars and trilling, tinkling piano riffs echoing in the background; the Vandellas sound good, Martha and the girls giving deep and robust backing. It’s far from awful, and I’m sorry if I’m making it sound that way – it’s not, it’s just a poor match of vocalist and material. The song calls for a coy but earthy lead with lots of quick changes and big high notes to hit; in 1962, on this record, Saundra just can’t quite pull it off. 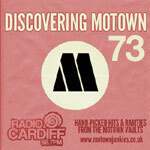 There would be no more records for Saundra and the Vandellas, but Ms Mallett (later Mrs Edwards) stuck around anyway; once she united with the all-male Motown group the Downbeats to form the Elgins, she would find her rightful place. As for the Vandellas, with Martha Reeves front and centre, they would be riding high in the charts less than a year later as one of the hottest groups in America. So perhaps, given the benefit of hindsight, it was a blessing in disguise that this single didn’t do any business, thereby allowing both singer and group to go their separate ways – just imagine what might have happened if this record had been a hit! Yeah but it makes a great album cut. Better that than them doing “good Lovin'” or “In the Midnight Hour”. Uh hey Clyde: It’s one of the finest songs ever recorded. And that’s just my opinion. Plenty of folk will back me up on that–they either haven’t found this spot or were too flabbergasted to respond–I almost was. I just discovered Saundra Mallett (and the Elgins) – how did I miss this incredible voice! I agree that her voice has too many high/low changes in it but I still think she sounds so distinctive for what was just the beginning of her career. She reminds me of Paul Williams of The Temptations – I am absolutely in love with her sound! You’ll want to get yourself a copy of the Elgins’ Motown Anthology CD – not only does it have all the Elgins’ material with Saundra on lead, it also has quite a few of Saundra’s solo Motown demos cut between this single and her joining the Downbeats/Elgins three years later. Well worth checking out. I’ve always had a soft spot for this track although I wasn’t familiar with it until the fall of 1968 when it was first issued In the UK on the ‘Darling Baby’ album. On that album there was no indication that it had been recorded some 4 years earlier than the other tracks, but it seemed a bit out of place with the rest of the album. She does have very distinctive voice, but it lacks any real power. Having seen some footage of the group on YouTube doing ‘Heaven must have sent you’, she looked very thin and somewhat frail so it’s not surpring her voice is lacking in power. Lovely melody on this track with some gorgeous piano work in the backing.